Bonita Lakes is one of the newest communities west of I-75 in Bonita Springs, Florida. The appeal of Bonita Lakes is it’s location and the updated, modern design of the homes and amenities. Built by Toll Brothers, the homes in Bonita Lakes feature the newest, most popular floor plans and design appointments. 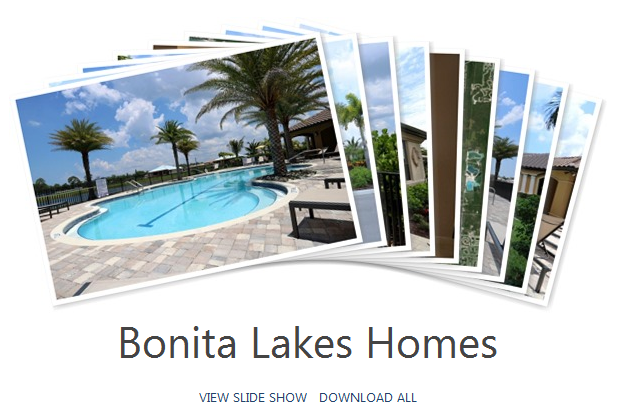 There are only single family homes at Bonita Lakes and no condominiums. Views from homes at Bonita Lakes include lake, landscaped area, privacy wall or wooded area. Since there is no golf at Bonita Lakes there are no golf course views. Many of the floor plans for the homes in Bonita Lakes are one story, ranch design but there are a few homes with two story design. Home owners had the option to install a private swimming pool and/or spa or to use the Bonita Lakes amenities center swimming pool. If a home in Bonita Lakes does not have a pool, a pool can often be installed after the fact, pending architectural review and approval. The community of Bonita Lakes is gated and has no CDD. Bonita Lakes offers fast access to Coconut Point, Bonita Beach and many other conveniences in Bonita Springs area. Naples and Fort Myers Florida area within 20 minutes drive of Bonita Lakes. Other homes in the Bonita Springs and Estero, Florida area with similar floor plan styles to the homes in Bonita Lakes include Belle Lago and Cordova at Spanish Wells. There are also neighborhoods with non-country club amenities which may be similar to Bonita Lakes located in Hawthorne, Bonita Isles and Paloma.